Dragons Gonna Drag: Guest Post: Which Dice Do You Trust? 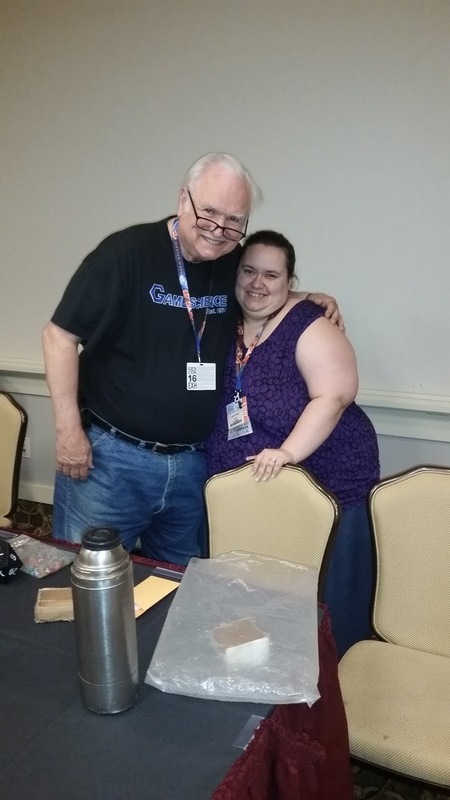 Justin's Note: In my post about Gen Con, I mentioned that Jess wanted to write a guest article for my blog about Louis Zocchi. I mean, I greatly enjoyed Mr. Zocchi's panel at Gen Con, but Jess? Considering how obsessed she is with dice, she was absolutely blown away. I swear to God that Mr. Zocchi didn't pay her to write this or anything. She just loves GameScience that much. As an aside, Jess makes these awesome pieces of jewelry out of dice with a little electric drill. She does earrings, necklaces, bracelets, and keychains, and they must be pretty fashionable, because people keep asking her to make them some. She says the d4 is the hardest to drill, in case you were wondering. Anyway, I'm glad she's here to share her enthusiasm with us. Without further ado, here's some cool stuff written by my best friend and favorite person. Which Dice Do You Trust? Before I go answering that question for you, let me tell you a little bit about myself. Growing up I never knew much of what I was into. I knew that I loved math in school and I always looked up to my brother. He is 7 years older than me and was a kind of cool guy, to me anyway. He loved video games and loved playing D&D. He had friends over from time to time and I got to sit in and watch them all throw those nifty little dice around and tell awesome stories. With my math skills I could add, subtract, and keep track of things fairly easily. I ended up being a mini human calculator for certain situations, so I became useful from time to time. It was fun and sometimes challenging to me. However, I didn’t have many friends of my own who knew about D&D, let alone how to DM. Heck, I didn’t even know what a “DM” was or have any books or knowledge myself. So, when my brother moved out, that part of my life disappeared. But a few years later, I met my friend (now husband), Justin. We have been together for almost 12 years and married for 2. During the beginning of those years we learned a lot about each other. We hung out for hours, sometimes days. And when you do that, you need stuff to do. We were always at his house so his belongings were the things we had on hand to use. After hours of video games, some time for lunch and dinner, out came the D&D supplies. I was so excited when he showed me he had the supplies AND knowledge to bring back the awesome story time that, my brother and his friends used to be able to entertain me with! And its moments like these that let you know, you have the right guy. (Mental note- NEVER LET HIM GO!) 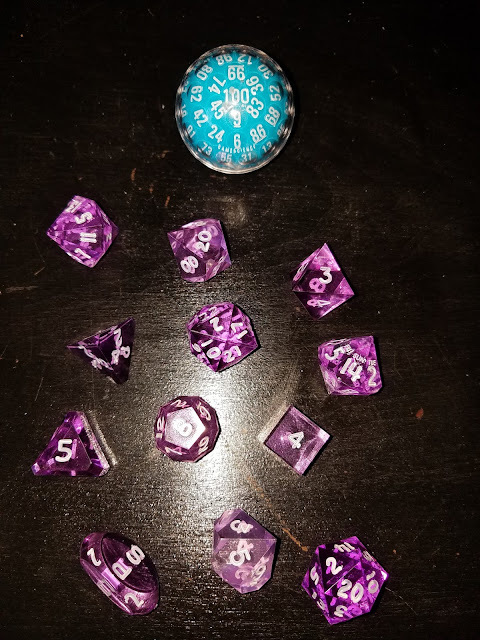 Anyway, after years of playing and bringing in a variety of friends and stories, I started to gain an interest in those little colorful things that we threw around, dice. Dice are beautiful things. They roll around and give you that tiny bit of excitement while you wait, hoping that they land on the numbers that work in your benefit. It adds some extra thrill to that story being told while you try to figure out your next move. But let’s be honest, you have to wait for that result before you know for sure what to do next. 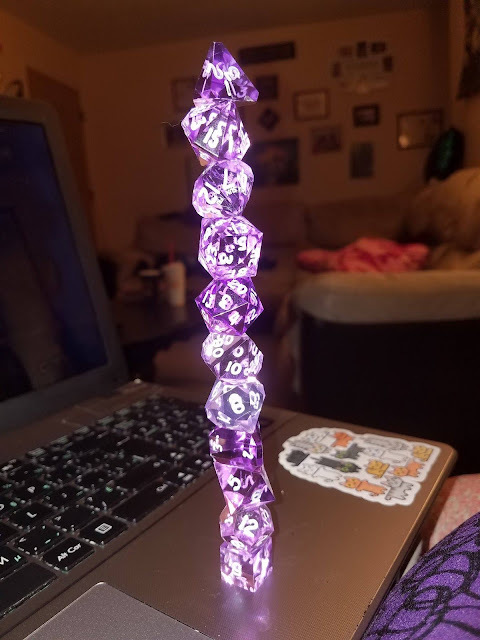 Even for those who don’t play D&D or any other RPG (role playing game), they come in handy for other games and even decoration! Adults will gamble and little kids will play even the simplest board games with them. So, I highly doubt that dice are going to “go out of style” anytime soon. Which make them a good collector’s item. But which ones should you collect and which ones should you actually play with? I have been collecting dice for roughly 5 years but, I bought my first set to play with about 10 years ago. 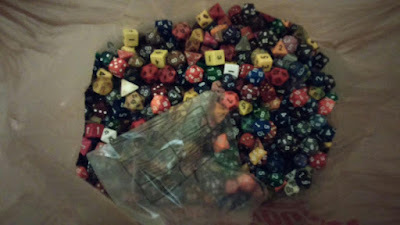 I have a large variety of “sets” of dice and a ton of individual dice. I make jewelry, magnets, key chains, picture frames, you name it. And of course, I play with dice too. After playing D&D for a long time I would notice that some numbers come up more often than others on certain dice. I loved messing around with numbers and I was good at noticing patterns. I didn’t think much of it and figured it was just an interesting coincidence. I kept playing and using different sets of dice just to see how they roll and learned that I liked certain sets over other ones. Then Gen Con happened and I learned that my pattern noticing wasn’t just a coincidence, it was a very important piece of information that I needed to pay more attention to! Gen Con is a very large convention that is full of outstanding events and amazing works of art. And I mean a VERY large variety of art! It takes hours to get around and is full of fun and information. There was an event that stuck out to me, so my husband and I decided to go. It was an informative speech about dice. Louis Zocchi was the man speaking and before this, I knew nothing about him. I walked in and sat wondering what exactly he was going to talk about, except maybe how they were made. And that’s what he did. He certainly fascinated me! 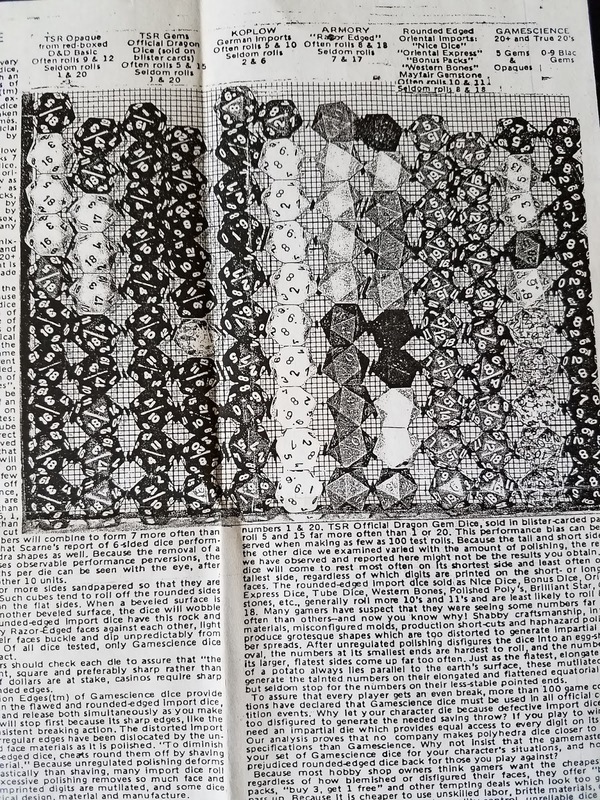 Louis Zocchi is a very intelligent man and was able to give me enough information to know that the smallest difference can make the largest change. He invented the 100 sided die, the zocchihedron! Louis Zocchi is a gaming hobbyist, former game distributor and publisher, and maker and seller of polyhedral game dice. He has made dice since 1974 and personally hand inks every die you will ever purchase from him. He also files down every die by hand to help keep them precise. He has run countless tests and experiments to make sure that the dice he creates and invents will roll with precision and chance. He, and other people running experiments (myself included), have shown that his dice roll the best with the closest to even chances of any particular side coming up. He showed how stacking other companies' dice, one on top of the other, will not always come out the same height with the same amount of dice. And with that bit of a difference, you can get one number coming up more than another. When dice are made, plastic is placed in a mold to create the shape of the dice. When this is done, they are then cleaned and painted. Once that is complete, they are put through a “tumbling” process to polish the dice, round the edges, and take off any spare pieces the mold may have left. (If you want more details on how dice are made, check out this site- https://www.awesomedice.com/blog/64/how-dice-are-made/) The problem with doing it this way and “tumbling” them through a machine is that they don’t get tumbled evenly. One edge or side may get more "sanding" than another. This causes one side to weigh more and be a different size than another. Therefore, the dice are not even. This is why Louis Zocchi will take the time and file down each and every die he makes, by hand, instead of letting a machine do it. Now, some people have had an issue with a small piece that shows where the dice mold had once held onto the dice. He does file this down as well and as crazy as it might sound, that has less of an effect on changing the amount of chance of a roll than, the amount of the die missing from tumbling in a machine. This can be proven in another experiment that has been done. This experiment is called the “salt water experiment”. It is done by placing a different amount of salt (depending on the weight of the die) in a cup of water and flicking the die around a bit. If the die comes up on different numbers and doesn’t come up in a pattern every time, it is a good and faithful die. 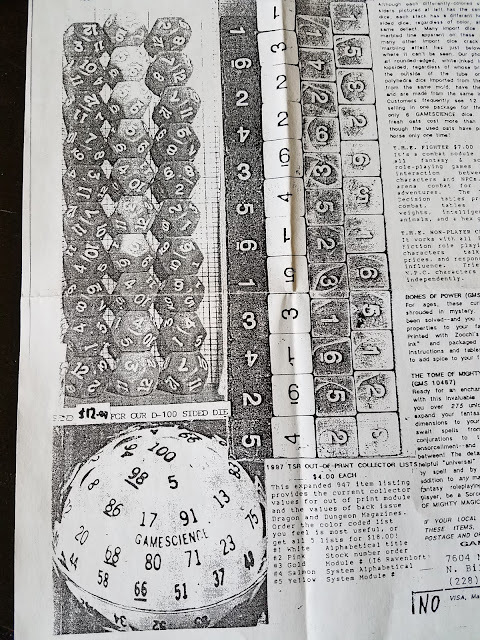 A large variety of people have tried this experiment with different sets of dice, and it seems the only trustworthy company is GameScience, the company owned by Louis Zocchi. There are other companies that will sell GameScience dice as well, but you can buy them directly from www.gamescience.com. Every dice set or individual die he sells is filed and inked by hand and made with care. Even some of the ones that seem like they wouldn't be fair, like the D5, are made to give fair results. So, when it comes to which dice I trust, I trust Louis Zocchi’s GameScience dice! They are handmade with care, precision, and plenty of math put right into the dice themselves. If you would like more information, or would like to listen to Louis Zocchi himself, check out the links below. I would like to thank all of my friends who play D&D with us, my brother James Densmore for introducing me to D&D years ago, and Louis Zocchi for showing me the truth in dice. I especially need to put a HUGE thank you out there to my Honeybee, Justin Stewart. I love you, forever and always. I have switched to using only Gamescience Dice simply because of the quality and feel of the dice. The crisp edges just do something for me. I am also a fan of the Artisan Dice series of dice but the cost is a limiting at this point. 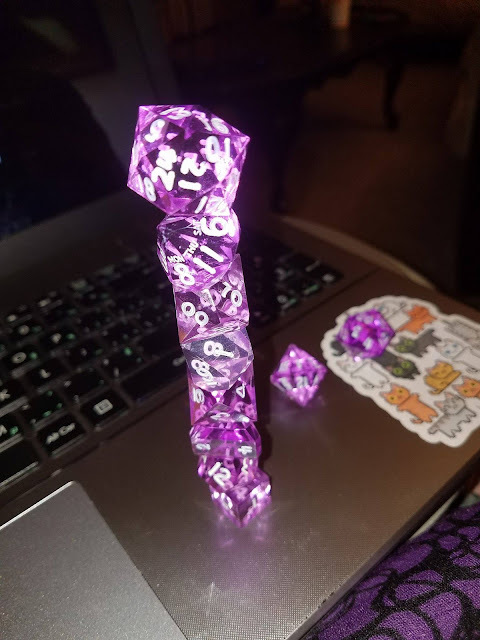 That being said the 2 sets of d6's that I have are truly a work of art. Yeah, Louis Zocchi certainly takes pride in his craft! His talk at Gen Con about all the little details of designing and testing fair dice was fascinating.